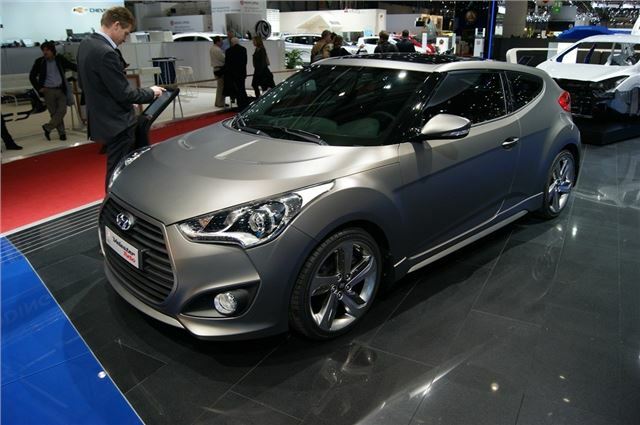 Hyundai has revealed the Veloster Turbo, which made its debut at the Geneva Motor Show. The turbocharged version of the new 1+2 door coupe is powered by a 1.6-litre T-GDI engine which produces 186PS and 270Nm of torque. It will go on sale this summer with prices expected to start at around £22,000. The Veloster Turbo is the first model to come with Hyundai's T-GDI engine which is based on the standard 1.6-litre GDI engine but fitted with a twin-scroll turbocharger. This considerably boosts power from the 140PS and 167Nm of torque the standard model offers. The new engine is designed to offer plenty of low down performance which is accessible in everyday driving. It has an air-guided intercooler and a direct fuel injection system. Acceleration from 0-60mph takes 8.4 seconds in the manual version which is 1.5 seconds faster than the standard non-turbocharged Veloster. CO2emissions and official fuel economy figures will be announced nearer the launch of the new Veloster Turbo but they shouldn't be too much of a leap up from the standard model which emits 148g/km (for the manual car) and averages 43.5mpg. It's not just the engine that's been upgraded in the Veloster Turbo though. It gets a quicker steering rack with a revised calibration for more precision in corners plus better feedback through the steering wheel. The suspension has also been enhanced with a more sports focussed set-up. It gets the same positive-shifting six-speed manual as the standard Veloster, but with a wider gear ration spread to handle the extra torque. Other changes include a sport-tuned engine intake and exhaust with the angular central tailpipe of the normal Veloster replaced by two larger circular exhaust pipes, giving a louder sound. On the outside there are unique bumpers, a different grille plus a new rear spoiler and LED rear lights along with 18-inch alloys with chrome inserts. The Veloster Turbo will come with Hyundai’s Five Year Triple Care assurance which includes a five-year unlimited warranty, five years of roadside assistance and five years of vehicle health checks.